Philippa H. Campbell, Ph.D., directs all of the research and training projects under the Child and Family Studies Research Programs (CFSRP) at Thomas Jefferson University. To make sure all toddlers in your early childhood program are participating, learning, and thriving, you need to master the art of choosing and using effective adaptations. 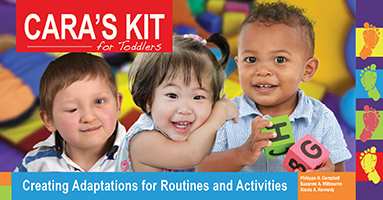 Practical solutions are in CARA's Kit: a guidebook and CD-ROM brimming with step-by-step ideas for adapting environments, activities, and materials for children 18 to 36 months.